A few weeks ago my friend Ashley introduced us this really neat dim sum place, just 15 minutes down the road in Little Saigon (which for you locals is right in Westminster). I often forget we live in such a food mecca outside the beaches and corner tacos, but there is a huge Asian population as well! You may have seen me chat about it when I made ramen for the first time. Celebrating #valentinesday dim sum style! And this is how we celebrated Valentines Day, dim sum style! This place was packed and awesome! You barely find the door downstairs with used mats and stacked chairs, then you walk upstairs to this huge room of hustle and bustle, of waiters fleeting through the tables dim sum carts in hand. Sticky chicken feet and pot stickers flying through the aisles, stacks of small plates on patrons tables and the smell of sterno promptly keeping the awaited food nice and hot. Now that smell won’t leave your nose for a while. And really, check out my pleating action, will ya? I mean for the first time, it’s not half bad! 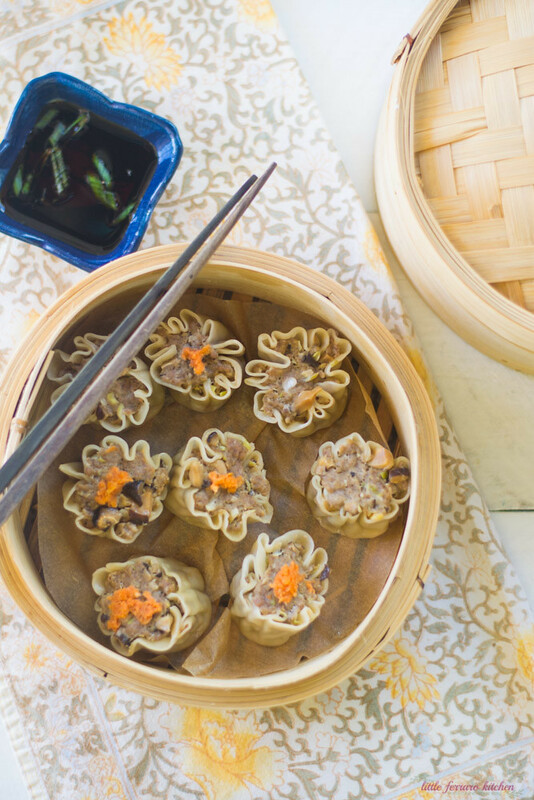 Traditionally shumai is often filled with ground pork, but I did a little twist and used wild boar instead (and still calling it pork and mushroom shumai). It is MUCH leaner than it’s cousin and has a bit more of a deep flavor which I really liked. To make the pleats couldn’t be easier. Hold the round wrapper in the palm of your hand and use a butter knife (it doesn’t have a sharp edge) to spread the mixture on smooth and flat. Then use the tip of your knife to indent the wrapper, making pleats! I wasn’t able to show you how to make the pleats exactly since I was alone and you need 2 hands, but this video helped tremendously! To follow my Chinatown adventure, be sure to follow me in Instagram since I’ll be posting play by play photos on there! And tell me…what will you be making to celebrate Chinese New Year? If you haven't already, add 3 dried shitake mushrooms to a cut of warm water and allow to reconstitute for about 20 minutes. Once ready, cut off the stem and chop the mushroom very finely. In a medium bowl, add the ground pork and everything else up until the carrot (that will be for garnish). Mix everything together and add a bit of the mushroom water to soften the mixture (about 1/2 teaspoon). Set aside. Place a wonton wrapper in the palm of your hand and use a butter knife to spread about a tablespoon sized amount of filling onto the wrapper. Then use the tip of the knife to make pleats, while holding the shumai upright. Use the knife to spread the top smooth and flat and place on a plate until ready to add to the steamer. Meanwhile, get about 1/2 inch of water in a medium sized pot and place a bamboo or other kind of steamer in the pot, but not touching the water. 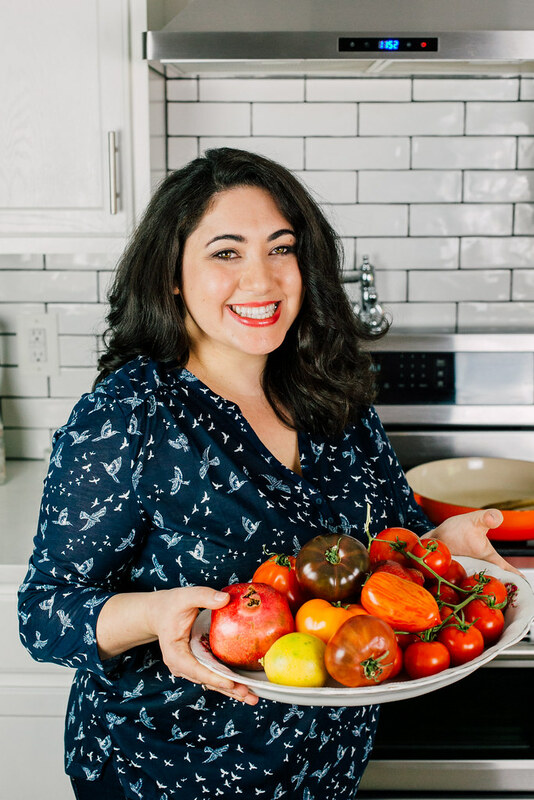 If you don't have a steamer, you could also place a bowl upside down with a place on top instead. 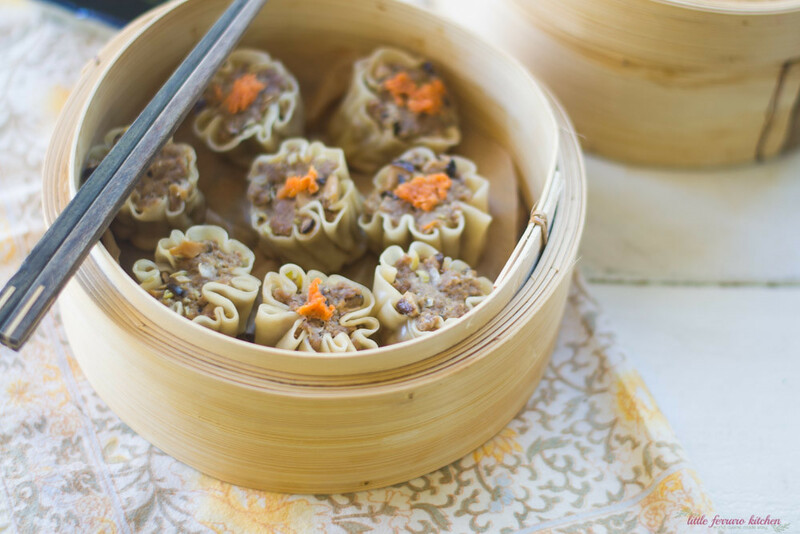 Line your steamer with parchment paper and cut a few holes in it to allow steam to get through and place shumai in the steamer. 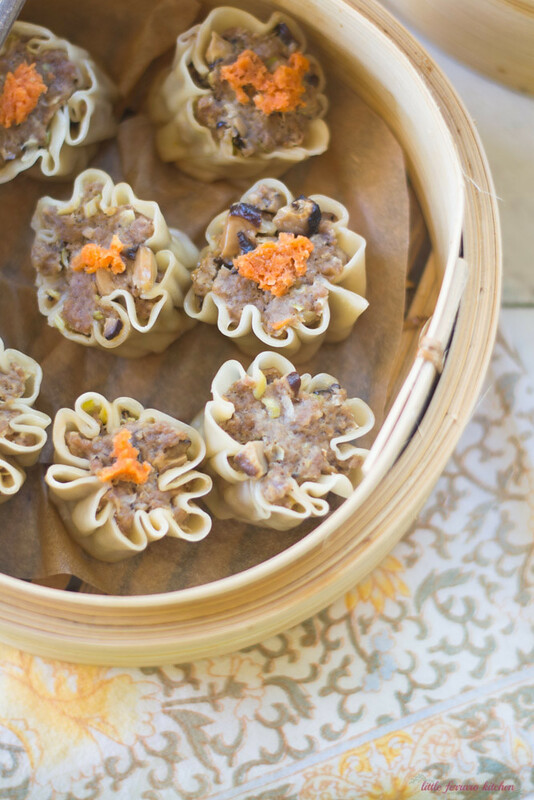 Cover and cook shumai for about 20 minutes or until the pork is fully cooked. To make dipping sauce, add all ingredients together and serve shumai with sauce and hot mustard.